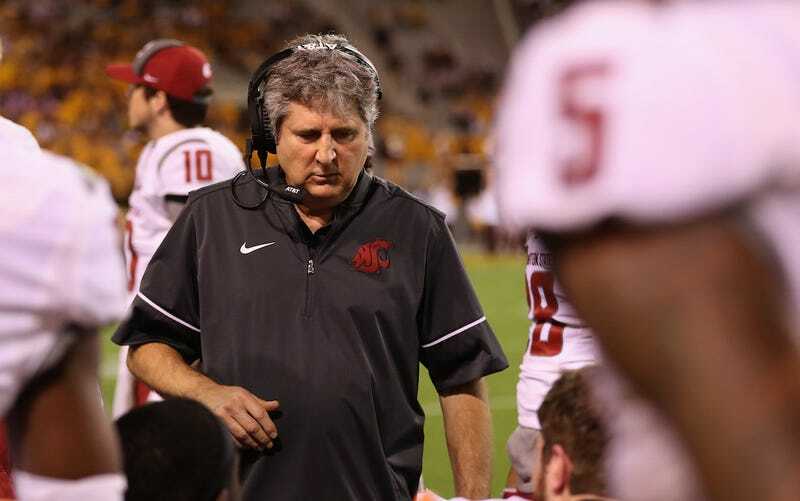 Washington State football coach Mike Leach has said he has a policy that any player who commits one of three acts will get kicked out of the program: violence against women, illegal drugs, and stealing. One former Cougars player is suing because he says he was unfairly dismissed, and Leach isn’t actually consistent with his rules. Cornerback Zaire Webb and receiver Anthony White Jr. were dismissed from the team in October, a day after Pullman Police cited them for misdemeanor third-degree theft at a Walmart. A few days later, the school informed Webb that his scholarship would be pulled at the beginning of 2018. He was allowed to appeal but says he wasn’t allowed to attend or participate. In December, the charges against Webb were dismissed due to insufficient evidence. Webb’s lawsuit, filed March 2 in Whitman County Superior Court, argues that Leach inconsistently applied the rule to him. The suit lists examples of other players who have broken the “three sins” policy and weren’t kicked off the team. Linebacker Logan Tago took a plea deal after he was charged with felony robbery and assault in 2016 for mugging a guy for a six-pack of beer. (The Cougars recently used Tago’s mandated community service as a feel-good story.) He’s still on the roster. Former cornerback Daquawn Brown was charged with felony second-degree assault in March of 2014 after he allegedly punched a man and woman in the faces during a night out. He was allowed to play in the 2014 season and led the team in tackles before Leach dismissed him in December of that year. Receiver Grant Porter was arrested and booked on a domestic-violence charge in November of 2017 for allegedly grabbing his girlfriend’s neck and pushing her to the floor. The lawsuit says he is still on the spring roster. (Washington State has not answered a question as to whether this was accurate, as well as a request for comment on the suit, but Deadspin will update if the school responds.) Update (3:36 p.m. ET): A Washington State spokesperson says Porter is suspended indefinitely, and the school has no comment on the lawsuit. Webb’s complaint argues that these are all examples of Leach’s “firm” policy instead being totally arbitrary. The 18-year-old is asking for unspecified damages suffered. In the months leading up to his dismissal, Zaire was involved in a series of events that called to question his commitment to the football program, as well as came into direct conflict with our team rules. Zaire played as a true freshman on our football team in the first few games of this season and it was not our desire to remove him from our team. His was performing on special teams and we can only assume with time in our program that he would have continued to improve on the field. A consistent standard needs to be maintained in dealing with the conduct of our players. Every player is held to the same standards here and we have demonstrated that talent, athletic ability, age, or classification have no bearing on whether we keep or remove a player that violates any of our team policies.